No more disposable batteries! This rechargeable battery box has build-in Li polymer batteries to ensure low weight and powerful action. 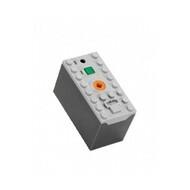 Use this in your LEGO Power Functions models and end your need for disposable batteries!